"The Road Goes Ever On and On…Down to the Door Where It Began". So wrote J.R.R. Tolkien, creator of "The Lord Of the Rings". My family lives in Middle-Earth; around here it's called Asturias. Surrounded by green mountains and rolling hills, the landscape bears strong resemblance to the descriptions found in Tolkien's works. 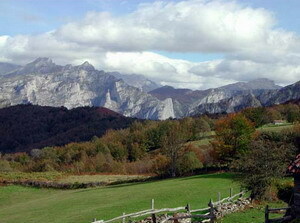 Located on the north coast of Spain, Asturias is known for being fresh, temperate and green. Very green. Spaniards call it "Paraiso Natural", a 'Natural Paradise'. Wandering around the countryside here, I half expect to see elves, trolls, and halflings- and I must say some folk around here do indeed resemble hobbits, or characters out of a children's story. Very quaint and picturesque. As I go walking around this land, the thought of roads and ways 'going ever on' becomes reality. Every village is connected to the surrounding fields and woods by a network of linking cowpaths, which ultimately reach the next set of paths, and so on. Tolkien was right, all roads are one, like a river with many branches. That's what I love most about the walking (or running or biking or horseback or however you choose); every time is different, because after 4 years of exploring here I still find new ways, paths I have yet to tread, or new connections with the old ones. This is real magic. The environment here is similar to that of lower Britain, to Atlantic France. But much softer in climate, warmer and sunnier (at times). The coastal north of Spain is separated from the rest of the peninsula by a chain of mountains, the Cantabric mountain range. This blocks out the southern heat, and forms a southern border to the great Maritime Arc of North-West Europe. This is about as far south one can go and still be in Northern Europe, geographically. Culturally is another story, because many different people have come through this land at one time or another. The Celtic influence is strong; bagpipes and wooden shoes are commonplace. So are castanyets (Arabic finger cymbals), Gypsy sounds from Andalucia (South Spain), and olive oil from the Mediterranean. Asturias is certainly part of Spain, only it lies up north, beyond a barrier of high mountains (the tallest peak is the third-highest in Europe) that have historically blocked out much of the rest of the country. The mountains are hard to get over, but these days tunnels drilled through work well, what with the freeway and all…a high speed train line is due at some point in the future, so for now we must content ourselves with standard Eurorail. There is an international airport as well. By car it's 4 hours to Madrid, and about 3 hours to the border with France. Asturias is an average 50 miles (90 km) wide, and a debatable 150 miles long (depending how you mark it). Given the climate, this is too far north for much wine-making, but apple trees grow in abundance, so alcoholic cider is the local drink. And it is renowned throughout Spain, now gaining popularity abroad as well. The cider is thin and vinegary, best for clearing the digestion, although there is also a sweet version, without alcohol. I like it after a nice run through the hills, which brings us back to the paths. When one goes out 'trekking' it will soon be noticed that there are many many trees, including the apple. Chestnut, oak, sycamore, ash, beech, walnut, hazel, firs, and eucalyptus…which is an import that took root in the last century. There are also some palms, especially closer to the coast (another import of course). In orchards or standing alone there are cherry, pear, apple, plum, fig, peach, besides a multitude of berry bushes - blackberry, currant, raspberry, european blueberry. A favorite pastime when out and about is stopping to enjoy some of nature's gifts, a welcome refreshment on a long hike. It bears repeating that although this is a Northern clime, Asturias is far enough south to support a variety of flora; in addition to the trees named above there are oranges and lemons that do quite well, as long as they are in a good spot, and kiwis (must have come with the eucalyptus). As with real estate, everything is 'location, location'. A protected hill-side facing south is perfect for flora that need the heat. Which is also a good spot for tomatoes, peppers, or melons. There many gardens here, both floral and vegetable. Sometimes they pop up in surprising places, far from any house, along side some path with stone walls and thick hedges. Rows of corn, with beans climbing the stalks; potatoes and varied greens; different vegetables and herbs; produce and plenty in season. A careful eye will spot wild herbs when moving about the land: mint, thyme, marjoram, rosemary…some of these have been planted, and grown wild, others happen on their own. Watch out for stinging nettles, but at least there is no poison ivy! I have learned something about grazing animals from all this. Even regular milk cows have a natural environment (outside of feed-lots and stalls). Sometimes during a walk a clearing in the woods will appear, and behold! Cows grazing among the trees and in the meadows. They actually like wandering about, feeding off the land, winding in and out among the trees, clambering up hill-sides, getting a cool drink from the creek, relaxing in the shade…just like humans! Deer are also found, and it is quite common to encounter these. There is a smaller kind and a larger more standard variety (bushy white tails) and these will graze where they find pasture, or move around the woods. Wild boar are plentiful, and hunting for these and the deer are common. Some areas have been designated 'hunting zones', as well as the 'fishing zones'. This is a trout and salmon area; the coast is of course known for the variety and abundance of marine life. In the higher mountains there are bear and wolves, but so far I have stuck more to the 'in- between' places, away from the coast and yet below the heights. We are here surrounded by lower mountains, yet impressive. These provide a plethora of ways to go, from hilly countryside to higher climbs, where the trees thin out and goats pasture. The autochthonous breed of cow (usually for meat) is the 'Asturian of the Mountains' which half resembles a goat in it's lanky toughness, narrow head with goatish horns, and the ability to scramble over rocky mountain-sides with the best of them. These days, with a declining human population, and a vanishing tradition of cowherding, people are putting a variety of grazing animals out to pasture, if only to keep the grass down and maintain the fields. Sheep, goats, horses, donkeys, whatever will eat the prairie- we know a family that keeps ostriches! One of the best routes to take in this particular area is called Fuensanta, which takes its name from the famous springwater found there. This water is bottled and sold throughout Europe, and the natural beauty and freshness of the place tells why. Here is a gorge which rises steeply into the mountains, reaching a series of waterfalls which are the source for all this wetness. Fill your bottles up at the beginning of the path (there is a public fountain) and walk the 6 mile (10 km) loop, following the rise of the land to the falls and then descending again. Make sure you brought some empty bottles in the car so you can fill them up for drinking at home. Yes, we live in Middle-Earth. I know this to be true when on an early morning the mist hangs over the valleys and dales between hills, when the rolling fields rise to meet the looming mountains at sunset, when the stars shine clear and bright in the night-sky. The view from a highpoint shows the landscape dotted with houses, fields, grazing animals, gardens, fruit trees, and the wooded slopes of the mountains surround valleys of hills. There is land to plow and woods to walk and waters to swim. The sea is less than an hour away from the ski-slopes on high mountains, whose peaks are snowy most of the year and tower in the distance. This land is indeed a Natural Paradise.